At the forefront of informal science learning, we are, in some ways, naturally good at gazing fearlessly into the future. But while we may be better equipped than those in many other fields to strategize for upcoming changes, it’s difficult to see very far ahead, or to know the best direction to take. 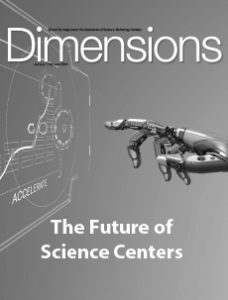 In this issue, four articles show different ways to envision the science centers of the future. One outlines the three pillars that will guide one science center’s path in coming years. Another asks us to step into the past in order to gain a clearer perspective on what might lie ahead. One article discusses the difficulties faced in staffing and in-house expertise and proposes considerations for the implications of these changes. Another article identifies specific approaches to large societal issues and shows how one institution is working to effect change in partnership within its community. Through all of these stories these institutions outline their own strategies for maintaining relevance. What is your institution planning for the future? Where do you see science centers excelling in coming years?